In Montana, real property can be transferred from one party to another by executing a warranty deed. These deeds are valid for both residential and commercial transactions. 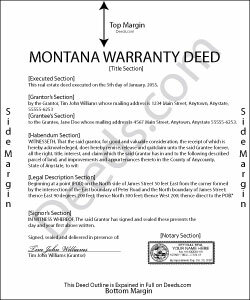 Warranty deeds are not statutory in Montana. The state provides a general form that may be used for a warranty deed (Mont. Code Ann. 70-20-103). The warranties included in this type of deed are not defined by statute, except for covenants implied by the use of the word "grant." The word "grant" implies that, prior to the execution of the conveyance, the grantor did not convey the same estate or any right, title, or interest to any person other than the grantee. It also implies that, at the time of execution of the conveyance, the estate was free from encumbrances done, made, or suffered by the grantor or any person claiming under the grantor (Mont. Code Ann. 70-20-304). A standard warranty deed also covenants that the grantor will warrant and defend the title against the lawful claims of all person. As with any conveyance of realty, a warranty deed requires a complete legal description of the parcel. Recite the prior deed reference to maintain a clear chain of title, and detail any restrictions associated with the property. The deed should meet all state and county standards of form and content for recorded documents. This article is provided for informational purposes only and is not a substitute for legal advice. Contact an attorney with questions about warranty deeds, or for any other issues related to transfers of real property in Montana.